Fractures involving the spine are not the same as breaking an arm or a leg. A dislocation or fracture within the spine can cause bone fragments to intrude upon and effect the nerves within the spinal cord. Spinal fractures are commonly caused by traumatic events such as a car accidents, as well as slip and falls, and participating in various sports. Injuries can range from generally mild muscle or ligament strains, to dislocations and fractures of the bony structures within the spine, or vertebrae. Such an injury can be debilitating and cause spinal cord damage. Depending on how severe an injury is, many people experience significant pain, difficulty sitting or walking for extended periods of time, or even an inability to move arms or legs. In other words, a feeling of paralysis to the extremities. Most fractures heal on their own or with conservative treatment. But severe fractures frequently require surgery to realign the bones. Fractures can occur anywhere along the spine. When more pressure is put on a bone than it can withstand, it will break. The most common form of spine fracture is called a vertebral body compression fracture. In other words, a sudden downward force shatters and collapses the body of the vertebrae. If the force is great enough, it may send bone fragments into the spinal canal, called a burst fracture.Spinal column and Spinal CordThe spine is made of thirty three bones called vertebrae whose purpose is to provide primary support for the body. The spine allows you to stand upright, twist and bend. Within each vertebra is a hollow space which is called the spinal canal and provides a protective shield for the spinal cord. The spinal cord's primary function is to serve as an information conduit between the body and the brain, often relaying messages. In particular, pain messages. Nerves branch off the spinal cord and between the vertebrae to many parts of the body. The spinal column and spinal cord are durable, but once its injured and damaged people often have a difficult time alleviating the pain and feeling normal again. There’s really no simple cure all for many spine injuries. People with spine injuries try everything from medications, to chiropractic care, steroid injections, yoga, physical therapy, and acupuncture. Sometimes only major back surgery is the answer, and even then it’ll sometimes only provide moderate relief. WhiplashWhiplash is a common injury to the neck caused by hyper-extension: aggressive and sudden back and forth motion of the head. 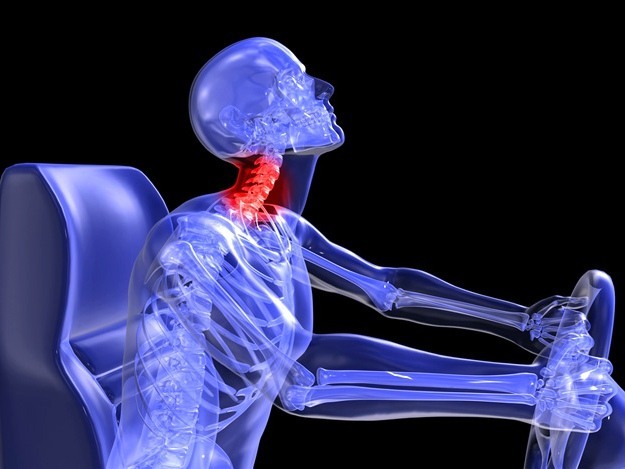 This type of injury most frequently occurs in a car accident. The violent jerking motion puts enormous strain on the muscles and ligaments of the neck. Sometimes, the jerking motion is so violent it causes the discs within the cervical spine (the neck) to bulge. When this occurs, all sorts of problems can result, such as headaches, stiff muscles, pain, or even a pins and needles or paralysis type feeling in the upper extremities.